• The co-op system evaluate the quality of your cooperation and rewards great teamwork. • Coordinate your attacks with your partner and fill up the central co-op gauge to unleash one of the deadliest attack of Samurai Riot: the Co-op Special Move! • Deep moral choices: would you rather burn an entire village to the ground or stay clean but lose the war? Any decision you make will greatly impact your story. • Choose to follow the same path as a team or choose to disagree and battle it out during a PvP fight! 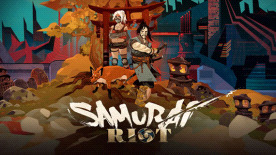 • Multi-branching scenario: be ready to play many new games to get all the whole story of Samurai Riot! • Fighting schools: the more you play, the more you accumulate points to unlock new fighting schools, each character will get exclusives gameplay variations and abilities. • Characters: discover two strong and highly skilled heroes offering unique gameplay and stunning attacks, plus a bunch of vicious enemies to fight against. • Controls: to remain true to arcade games history, we created very intuitive controls, enjoyable with any Controller or Arcade stick. We want the gameplay to be completely flexible, so it feels exactly like what you want it to be!